Water and electricity – two things that we normally avoid bringing in contact because it can lead to a bad accident. And there comes the question, how could this combination be an essential survival strategy for many fish species? Electric eels are one of the most known examples and will be presented in this article for the theme session „Electricity“ with regard to their electric properties and possible biomimetic application. Electric eels (Electrophorus electricus) belong to the order of Gymnotiformes (knifefish – because of their long finless body) and are the only electric species of that order. The term electric fish describes any fish that can produce electric fields. They are also called electrogenic. On the contrary, there are also species able to detect electric fields and are called electroreceptive. Common examples of electroreceptive fish are sharks, rays and catfish, which can detect electric field and use it for hunting and navigation. Not to get mistaken, there are also electric rays and catfishes, which besides the eels can generate an electrical discharge strong enough to stun prey. 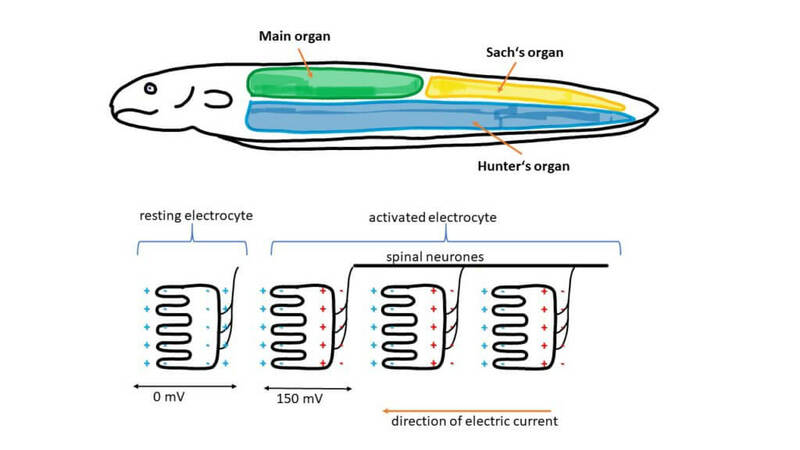 Electric eels possess three special large electric organs, the main organ, the Hunter’s organ and the Sach’s organ (Figure 1), representing 4/5 of their body. They are made of electrocytes (electric cells) and transmit electric signals of different frequencies. The main and the Hunter’s organs are high voltage producers (several hundred Hertz), serving for hunting, protection and fright reflex. The Sach’s organ produces only low voltage pulses (up to 25 Hz) and is therefore used for electrolocation . The eel’s narrow body shape and its straight way of moving play an important role to maintain a uniform electric field around itself. The electric organs, presented earlier, are composed of muscle-like cells called electrocytes. Like muscle cells, they are attached to nerve cells (axons) but they have no ability to contract. Due to their disc like form, up to 200 000 of such cells are aligned in series within the organ, being responsible for the discharge . Each electrocyte is capable of producing only a small voltage (up to 0.15 V)  but with a basic understanding of electrochemistry it becomes clear that the final voltage (potential difference) is actually the sum of each of these cell voltages. When the eel finds its prey, the brain releases a nerve impulse to the electrocytes, which opens ion channels across the membrane of all electrocytes along the organ simultaneously. Sodium ions flow inside the cells, causing a sudden difference in electric potential (see Figure 1). This generates an electric current, like in a battery which is made of stacked plates. Figure 1: Eeel’s electric organs with aligned electric cells (electrocytes).When the brain sends a signal, they polarize, creating a positive and negative side, sort of like a battery. This charge difference across the cell creates a small electrical field of about 0.15 volts. Freshwater fish (e.g. 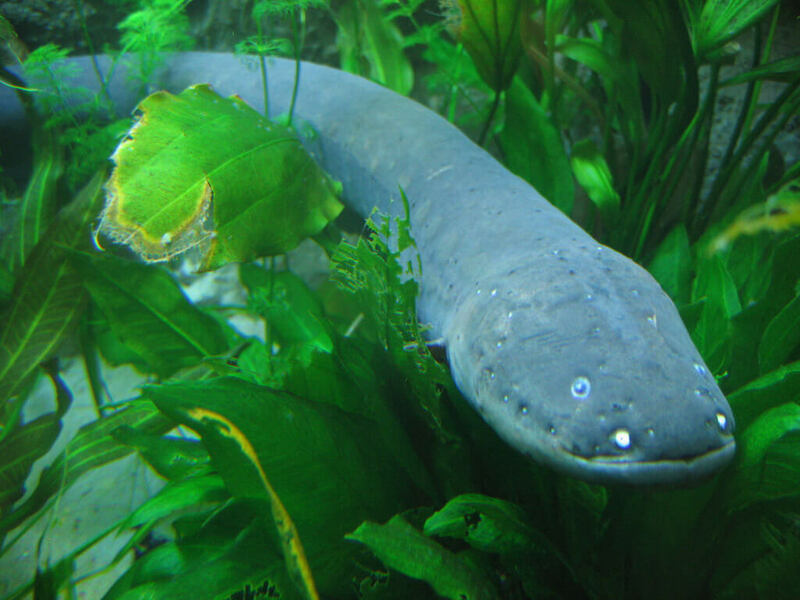 eels) produce high voltage with low current discharges. The power delivered is limited by the large resistance of water (due to lack of ions). Therefore, numerous electrocytes are arranged in series. Marine fish (e.g. electric ray) produce low voltages with high current discharges. The maximal power is not limited by the conductance of salt water but by the resistance of internal organs. Hence, their electric cells are aligned parallel. While stunning their prey, electric fish themselves also get shocked. If they would live in air, or let rather say, birds would hunt by using electric discharge, they would turn into a crispy snack. In water, the current is dissipated over the whole fish’ surface into the surrounding, therefore this hunting technique is worth using, after comparing costs and benefits. A small prey actually receives only a small portion of the total current generated by the eel. But since the volume of their body receives proportionally much larger current, the pray gets shocked while the eel feels only slight discharging. If you might have thought of a system using the electric eel’s principle to produce electricity, there’s quite an important fact that should not be neglected. In order to make electricity useful, the „eel“ would need to keep releasing it at a constant rate, which is not the case in reality. Nevertheless, scientists already developed some solutions of stacked layers of artificial cells, capable of producing continuous power . With appropriate power outputs, such solutions could drive small implant devices . Further research tends to develop artificial electrocytes made of human stem cells for such purposes . 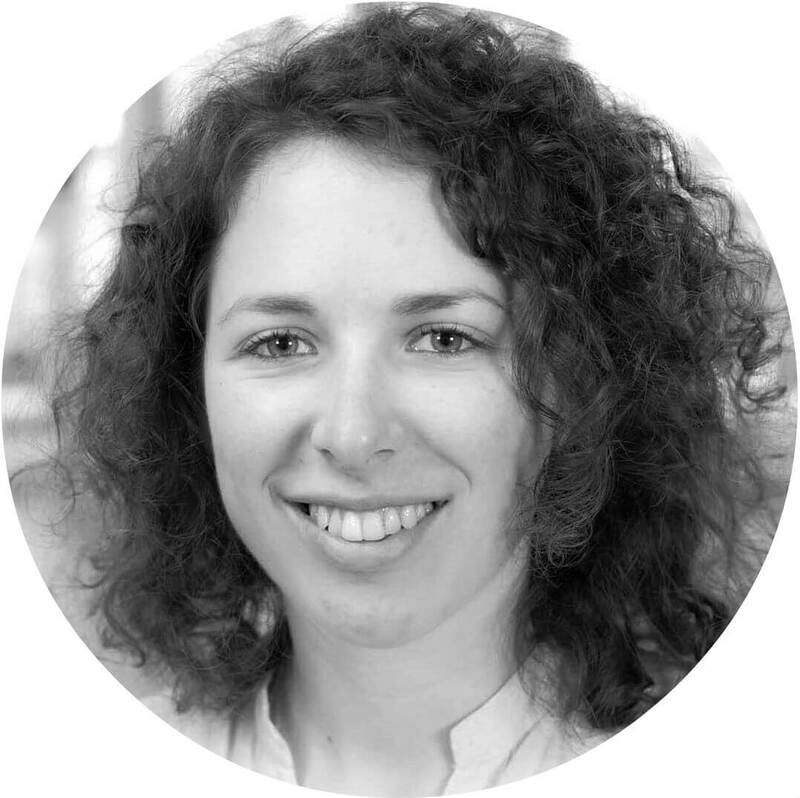 Another interesting application field is the growing market of wearable electronics. If today people are measuring their sports performance or fitness level by using portable devices, such as watches, necklaces, etc., the future seems to be in electronic clothes, measuring all our vital parameters. Further development strongly relies on the use of nanotechnology and deeper understanding of biological processes [6, 7].